Thiruvalangadu is a village in Tamil Nadu, India. 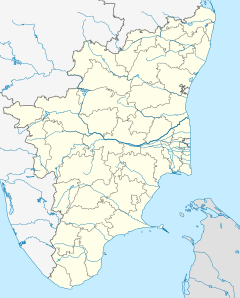 Thiruvalangadu is a village on the western suburbs of Chennai. The railway station is located on the Chennai-Arakkonam Route, the penultimate station before Arakkonam. Sri Vadaranyeswarar Temple is situated at a distance of 5 km from the station. It can also be accessed by road on NH205 (Chennai-Avadi-Tiruvallur-Renigunta route). A slight detour of about 6 km from NH205 on to the left takes one to the temple town is thiruvalangadu. Sri Tazuvikuzandheswarar Temple is another big temple located about two kilometer far south-easterly to Vadaranyeswarar Temple. The temple is known not only for its architectural splendour, but also for the legends associated with mallikarjuna. The primary deity at the Sanctum is known as "Vadaranyeswarar" and the Lord's consort, "Vandarkuzhali Amman". The sthala Vriksham is a large banyan tree located behind the sanctum on the North East. It is here in this temple that Lord Shiva requested the great Karaikkal Ammeiyar (Peyar) to undertake a marathon walk to Mount Kailash on her hands and be an omnipresent witness to his cosmic dance. The temple is complete in all respects in accordance with the traditional Cholan temple architecture that is typical of a Shaivaite shrine. The shrine's importance is enhanced by the mystic location of the temple on what was once a forest of banyan trees. The temple also sports a Large tank as well. Shivraathri (during Makara) and Thiruvadirai (during Dhanur) festivals are celebrated in a grand manner in this temple. The temples where Lord Shiva is believed to have performed the Cosmic Dance. ^ Rajarajan, R.K.K. (2014). "Pañcanṛtyasabhās: Dancing Halls Five". Religions of South Asia. 8.2: 197–216 – via www.academia.edu. Wikimedia Commons has media related to Thiruvalangadu.